Diabetes and Pre-Diabetes: Are you at risk? Posted on November 14, 2018 by Xenia Averkiou. This entry was posted in Eating Well and tagged eating well, rd blog. Bookmark the permalink. November 14 is the World Diabetes Day! 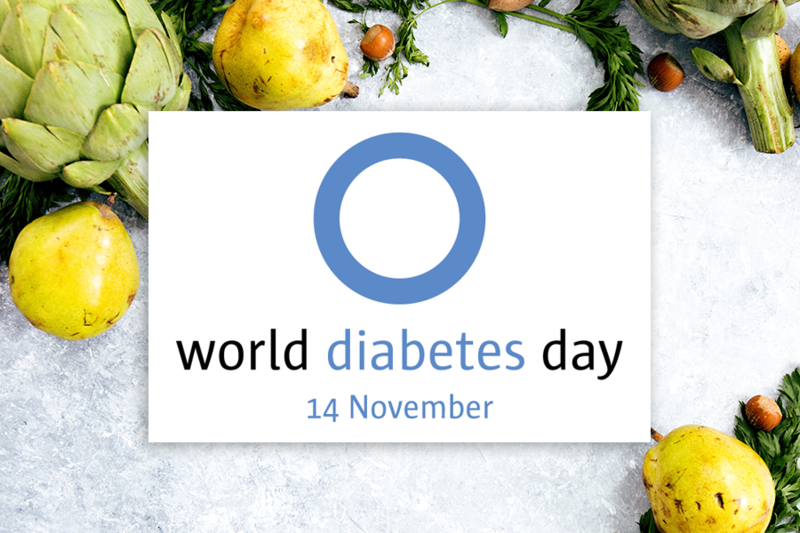 The World Health Organization (WHO) established World Diabetes Day in 1991 as an annual event for raising awareness in response to increasing numbers of diabetes cases around the world. November 14 was selected because it was the birth date of Frederick Banting who led to the discovery of insulin. As a diabetes educator, dietitian, and a person living with diabetes, I embrace this opportunity to raise awareness and to also provide you with some basic information about diabetes. I would also like to invite you to take the Diabetes Risk Test to assess if you, or someone you love, may be at risk for developing diabetes. Data has shown an alarming increase in diabetes diagnosis for both type 2 and type 1. Type 2 diabetes is at epidemic levels and more common than type 1, but type 1 diabetes is also on the rise and considered a serious health threat if not well-managed. WHO predicts that by 2030 diabetes will be the 7th leading cause of death in the world. Unfortunately, most people with type 2 diabetes never get a timely diagnosis because of lack of symptoms, infrequent doctor visits, and lack of access to medical care. Data for the state of Washington show that about 640,000 people live with diabetes. Close to one third of these people, about 173,000, are not diagnosed yet. Even more alarming is the fact that about one in every three Washington residents (~1, 874,000 people) have pre-diabetes and most of them do not know it either. Diabetes (type 2) can be avoided. Starting with preventing pre-diabetes makes most sense as most people with pre-diabetes will develop diabetes if not treated promptly. As a side note, type 1 diabetes is an autoimmune condition and the cause is still unknown, thus difficult to prevent it. But we can take steps to prevent type 2 diabetes! Some risk factors associated with developing pre-diabetes or diabetes are overweight, physical inactivity, age (older than 45), history of polycystic ovary syndrome in women or diabetes in pregnancy, and race (African Americans, Hispanics, Native Americans, Asian Americans and Pacific Islanders). Recent data shed light on the importance of lifestyle changes in diabetes prevention, which include healthy meal planning, weight loss, and regular physical activity (more information below). Quitting smoking can also play a significant role. Timely diagnosis and education can be the key for prevention, and to also better treat people with pre-diabetes or diabetes and help them reduce the risk of health complications. Thankfully diabetes education is covered by all health insurances, and starting this year pre-diabetes education is also covered. But what happens with people that do not have health- insurance coverage? There are excellent government- and community-based programs that are easily accessible by the uninsured population at a reasonable cost (described below). Remember that the majority of people with diabetes, or at risk for diabetes, might not experience any symptoms and that is why it is important to follow up annually with your primary care provider and do the recommended annual blood tests. 1. 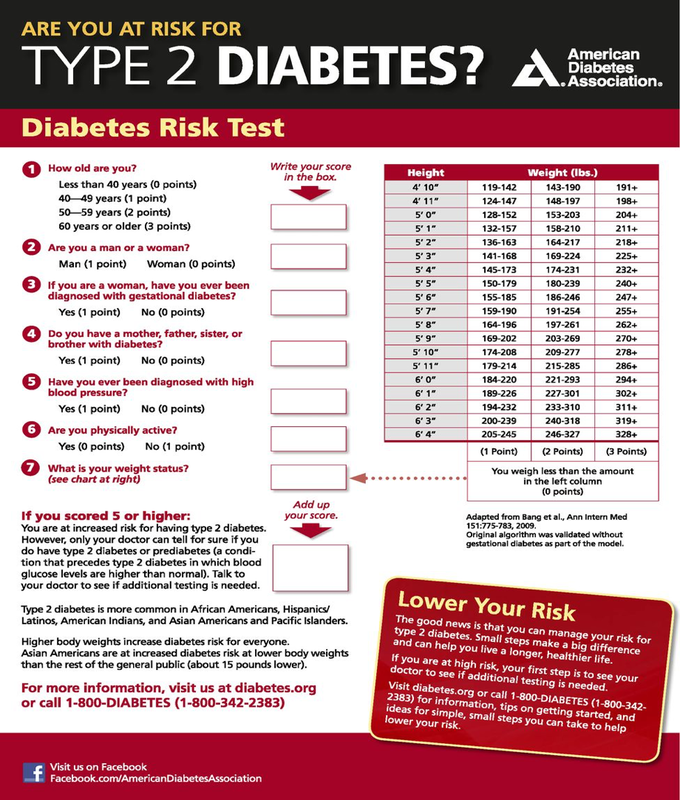 Take the Diabetes Risk Test. Firstly, I encourage you to take a couple of minutes and complete the Diabetes Risk Test which will help you assess if you are at risk for developing pre-diabetes or diabetes. Don’t hesitate.It is better to know than not know. A new diagnosis of a chronic condition, or even the diagnosis of an increased risk for a chronic condition, can be a scary event at first. However, early diagnosis and treatment can help prevent further health complications. 2. How is pre-diabetes or diabetes diagnosed? Both pre-diabetes and diabetes are diagnosed with blood tests and in some cases in combination with an oral glucose tolerance test (OGTT) that requires consuming a glucose containing drink. Pre-diabetes and diabetes require ongoing follow up and education by the diabetes care team which consists of a primary care provider and/or an endocrinologist, a Certified Diabetes Educator (Registered Dietitian, Registered Nurse, Pharmacist), Psychologist, etc. The first step to treatment is education for lifestyle changes. The Diabetes Prevention Study Group has shown with a very large study that structured lifestyle change programs can help patients with pre-diabetes reduce their risk for developing diabetes by 58% which is quite an impressive result. These lifestyle changes included a well-balanced diet with low to moderate fat, high fiber, 30 minutes plus of physical activity for at least 5 days a week, and a weight loss of greater than 5%(for example: ~10+ pounds weight loss for someone who weighs 200 pounds). A recent follow up study by the Diabetes Prevention Program Research Group showed that the impact of such a program could last for years to come. These data provided the support for government programs, employers, and health insurers to cover education for pre-diabetes which started this year for the first time. The Diabetes Prevention Program of the Centers for Disease Control and Prevention (CDC) serves as a great example of such a government program. Organizations that participate in this program use a CDC-approved curriculum. Local YMCA programs are examples of such community organizations. For patients with health insurance, or supported by University of Washington charity programs, the University of Washington Medical System also provides diabetes classes both at the Endocrine and Diabetes Care Center and at the UW Neighborhood Clinics. Patients that are unable to attend classes can request for a one-to-one visit with a certified diabetes educator. Any meal-planning model that supports a heart healthy diet, for example the Mediterranean diet, is appropriate for prevention or for diabetes meal planning. The Mediterranean diet model is focused on whole foods (avoiding processed foods as much as possible), is rich in non-starchy vegetables (variety of colors and types, preferably in-season), legumes (beans, lentils, chickpeas), whole grains (bulgur, barley rusks), fruits (preferably in- season), yogurt/cheese (mainly from sheep or goat milk), with low consumption of red meat, moderate consumption of poultry, and high consumption of fish. Main fat sources of this diet model are olive oil, olives, nuts and seeds. Decrease consumption of sweet drinks, such as regular sodas, juices, sweet coffee and tea drinks, and alcohol. Make sure to drink plenty of water daily. Choose whole fruits and limit cookies and cakes. Increase your vegetable intake with meals, or as snacks. They are low in calories and powerhouses of important vitamins, minerals and fiber. Practice portion control and mindful eating. Set aside time for meals and eat with family or with friends regularly. Choosing grilled, broiled, or steamed and limiting fried foods. Decreasing consumption of high fat processed meats such as sausages, hot dogs, and bacon. Be careful with portions even with healthy fats, such as nuts and avocados, as they are high in calories. November reminds us all that we must play a role in raising awareness about pre-diabetes and diabetes and the importance of early diagnosis and treatment. Diabetes prevalence is increasing at alarming rates and if not prevented or treated early it can lead to significant burden on both the individual’s quality of life and finances. Diabetes is a chronic condition, but can be a disease only if left untreated. People who manage their diabetes well live long and productive lives! Centers for Disease Control and Prevention. National diabetes prevention program. Diabetes Prevention Program Research Group. 10-year follow-up of diabetes incidence and weight loss in the Diabetes Prevention Program Outcomes Study. Knowler WC et.al. Lancet. 2009;374(9702):1677–86. doi: 10.1016/S0140-6736(09)61457-4. Finnish Diabetes Prevention Study Group. Prevention of Type 2 Diabetes Mellitus by Changes in Lifestyle among Subjects with Impaired Glucose Tolerance. Jaakko Tuomilehto, M.D., Ph.D. et.al. N Engl J Med 2001; 344:1343 – 1350. Xenia Averkiou is a Registered Dietitian and a Certified Diabetes Educator. She is passionate about diabetes education and lives with type 1 diabetes herself. She works at the Endocrine and Diabetes Care Center at the Roosevelt Clinic of the University of Washington Medicine. Outside of work she enjoys cooking, dancing, and spending time with her family and friends.